I’m quite excited about this launch as the project was a bit different to our usual website projects. 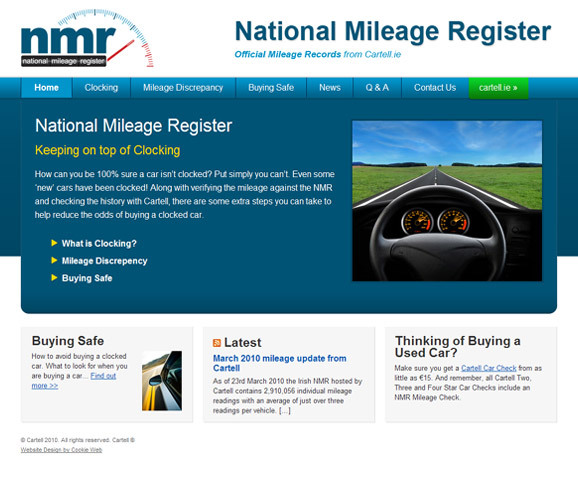 When we were first approached by the guys in Cartell.ie we were asked to do a very simple holding page-esque site for the National Mileage Register. We obviously impressed because a short time later they were asking us about their Cartell website and what improvements we would suggest. Redesign!!! Yaay 🙂 So myself and Heidi started working with the Cartell team and it was full steam ahead – review and improve the Information Architecture, redesign the look and feel of the site, introduce a blog area (these guys have lots of nice tips and interesting motor/mileage things to talk about). There is a lot of custom built functionality on the site so pairing that technology with a content management system required a bit more thought than usual. But after reviewing numerous CMS systems, Cookie Web and the Cartell IT team agreed that WordPress was the way to go. You just can’t beat the simplicity and ease of use of WordPress when it comes to updating the content on your website. This was a big factor in the project as we really wanted each department to take ownership of their content and have the ability to update it and keep it fresh. And that’s exactly what they’re doing. We needed to redesign and update Cartell’s website for quite sometime. We finally took the crunch when we saw Orla and Heidi’s previous work. Their expertise and talent put our minds at ease knowing Cartell was in the right hands. From day one Orla and Heidi’s professionalism and enthusiasm helped us determine what we wanted with the new design. The finished product has exceeded our wish list for the new Cartell website. We would highly recommend Cookie Web to anyone who is looking for excellent quality and service. Tune in to Newstalk’s Motor Mouth show every Monday night where Cartell’s Jeff Aherne is a weekly Motoring Correspondent. If you miss the show don’t worry as Jeff publishes a blog post about the main topic after the show. Since we were redesigning the cartell.ie website we persuaded the team to let us update the nmr.ie website too and bring it into line with their new styling. 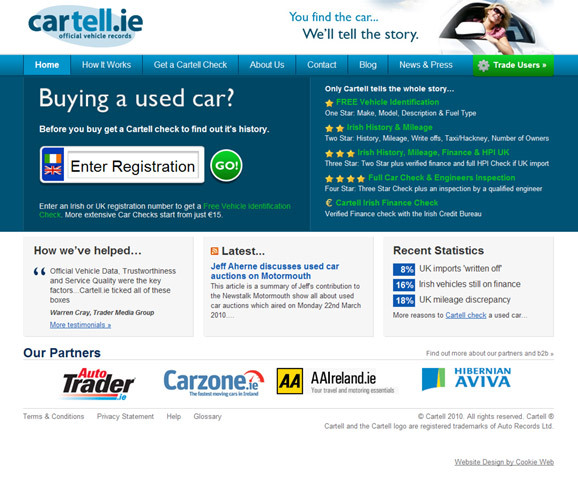 Cartell operate the National Mileage Register for Ireland so it makes sense for the NMR website to follow the brand and look and feel of the Cartell website. We created a new logo for the site which incorporates an odometer graphic and helps capture the essence of the site’s subject matter. The homepage has been designed in a similar style to the Cartell site and we have kept the same colour scheme in both sites.